Well here it is, 21 months later and I am just the happiest Beagle girl in the world!! That's me on the left on my mom's lap. I moved in with her in March of 2001. I was a little bit of a beagle girl and still am (when it comes to height anyway). I love sleeping on the couch, chewing greenies, going on adventure walks with Mom, going "bye-bye car", chasing bunnies, and snuggling. I am a happy girl who wakes up with her tail wagging and it doesn't stop until I fall asleep at night. I instantly charmed my way into the hearts of everyone at Applebriar apartments in Marlboro. That's how my two friends here, Sierra and her baby bro Oliver came to live RIGHT NEXT DOOR TO ME! Imagine THREE SAVE-A DOGGIES living right next to each other. We have just SO much fun. Here's their Mom and Pup (get it?? pup????) to tell you about them. Hi there, Sierra here. 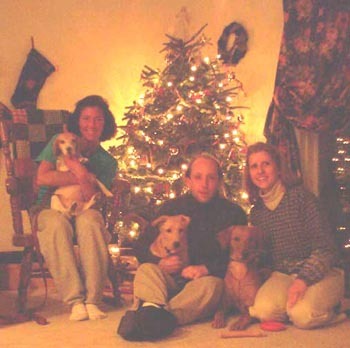 I'm the cute slender pup sitting inbetween my mom and dad. I was adopted in December 2001 and just had my first birthday in October. I love to run, play in the snow (hiding my head in the snow and scooting along under it is the BEST), chew on my nylabone, camp, hike and go for "rides". Last summer we did a lot of camping and hiking - what fun! You should have seen my parents faces the first two times I got into the little 2 person tent--I did a few laps around the inside (while they were inside as well -- heehee!). This October our family grew and we adopted my little brother Oliver. Sometime he gets to be a little much, but he's really great and I enjoy sharing my toys with him. Oh boy, he's pawing at the keyboard wanting a chance to type. Hi, I'm Sierra's little brother Oliver. I'm just 5 months old in this picture I'm the one sitting on my dad's lap). I love to play and going for "rides"! Sierra taught me how to scoot in the snow while keeping your head under the fluff -- what fun! My legs are a lot shorter than hers so I'm not able to keep up with her just yet, but I'm getting there. My parents are finding out that I'm a true retriever. I love to bring them their slippers and socks (sometimes they are already wearing a pair, but I can tell they have cold feet and need some more). Sierra has told me all about camping and hiking and I can't wait to experience that (she told me to run around the inside of the tent a few times while our parents are in it and watch their faces -- heehee!). I'm a bit sleepy so I'm going to put my mom on the computer. Thank you Save-A-Dog for such great pups! They have brought so much joy into our lives. We couldn't imagine being without them.